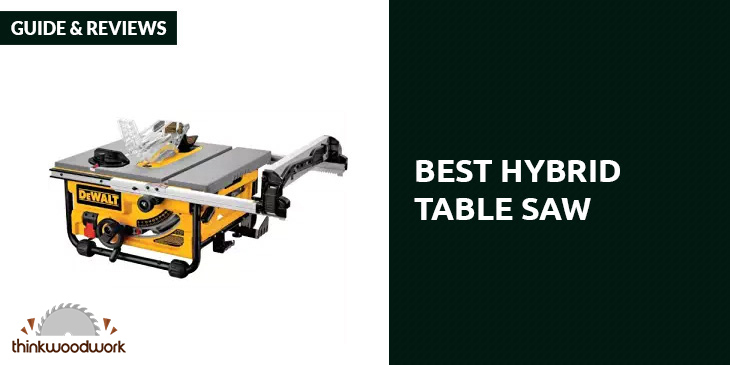 Are you looking for the best cabinet table saw to use for contracting jobs or maybe even just for your own personal use? Today I am going to be doing some reviews and comparisons to help you not only find the best but also to help you know what to look for so that you’ll know which one is best for your job. 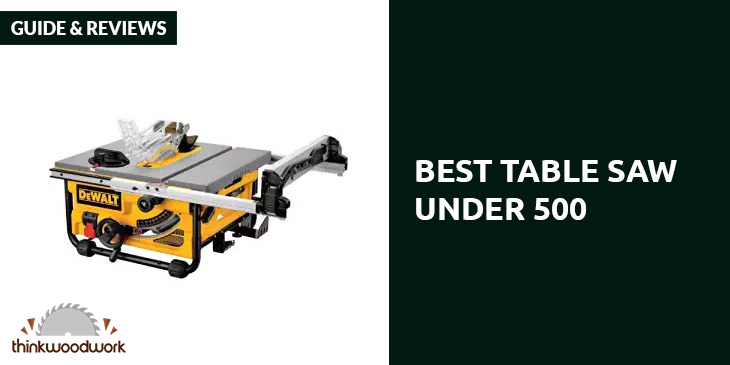 Before we jump in and take a look at the​ best cabinet table saw reviews, let’s first discuss a few features that really matter when it comes to getting the job done. When it comes to finding the best cabinet saw there are several factors to consider such as the horsepower, voltage, model, weight, and overall performance that you need. Let’s briefly take a look at each one so you’ll know what to look for. Horsepower - You will be able to find motors that have between 1.5-5 Horsepower so you’ll be able to make sure you are buying a cabinet saw that will handle your jobs and projects, but one thing you want to keep in mind is…with a bigger motor you are looking at a change in voltage. That means you will need to make sure your wiring system can handle the voltage. Voltage - It’s very important to pay attention to the voltage of the table saw you are buying because you want to make sure your house, workshop, or jobsite is wired for the proper voltage. You will find 120V and 240V the latter of which is more suited for contractor saws while most people use 120V saws, but obviously the higher voltage the more power it is going to have. 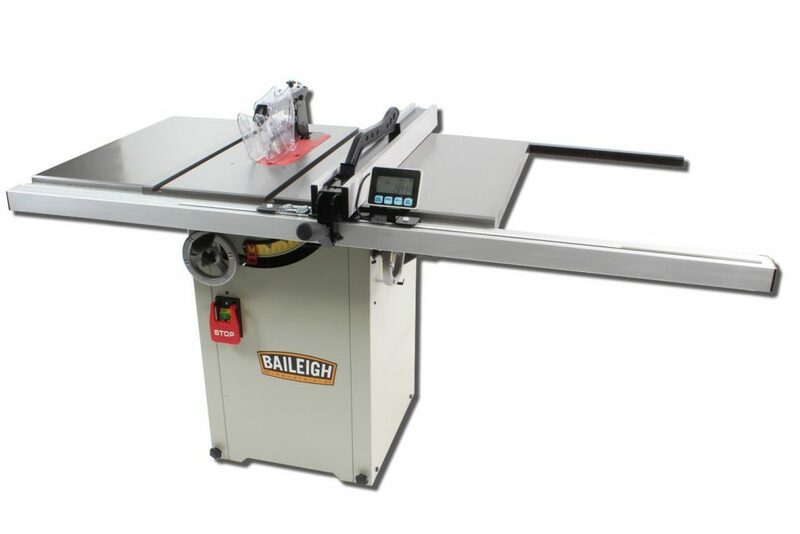 Overall Performance - You want a cabinet table saw that is tough enough to stand up to any job you have, so features such as durability, quality of materials used to build the saw, and safety features are very important to pay attention to as well. Now that you know which features are important to look for, let’s do a cabinet saw comparison between 5 of the best cabinet table saws I believe are good enough to get any job done. 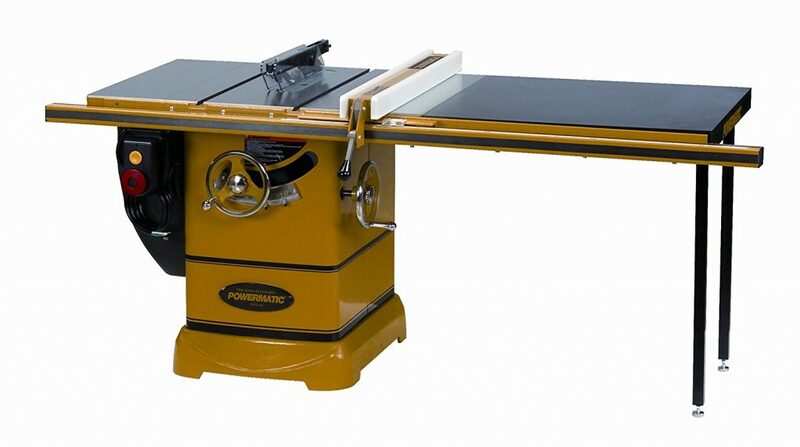 The Powermatic 1792000K PM2000 was inspired by input from hundreds of professional woodworkers and is an award winning cabinet table saw that was built to stand the test of time. Remember the important features we just discussed? First off, it has a 3 HP motor so you are going to be able to tackle those large jobs with ease, but keep in mind, with increased horsepower you are looking at an increase in voltage so you will need to make sure that you are wired up and ready for 240 V with this one as it has a 230V 1-phase motor. This thing features a massive size and the heaviest cast iron base in its class so you will never have to worry about table vibration as it’s virtually eliminated by the strong, durable base. The large oversized tables are also made of cast iron and have a smooth feel so your boards will seamlessly glide across the table and at 30.5 X 22-inches and the ability for the primary table to extend to 42-inches, you will have no trouble tackling even the largest jobs. Safety is always important on any jobsite and Powermatic kept that in mind when they created the PM2000 by adding a magnetic on/off switch that will automatically shut the table saw down if the magnet of the “key” ever becomes disengaged. This helps prevent accidental startups, damage, and other safety issues from occurring. You will get all of the accuracy you need from the 50-inch Accu-Fence System that ensures you make the most precise cuts every single time. Think of all the wasted material you’ll save. Is getting the job done fast important to you? You are going to love the tool free adjustments for the blade guard, riving knife and the push button arbor lock allows you to change blades lightning fast. Also, the oversized hand wheel makes it fast and easy to make height and blade adjustments so you can get back to the job at hand. Plus, thanks to the built-in retractable wheels on the bottom of the strong and sturdy cast iron base, you’ll never have to worry about straining yourself to move this 675 lb. beast around. 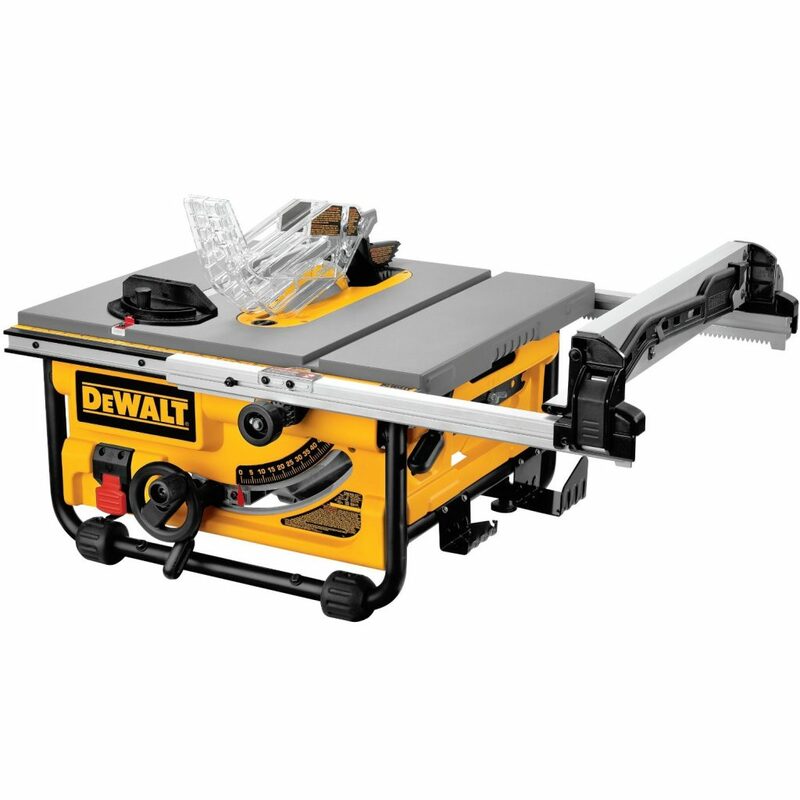 The Powermatic 1792000K PM2000 cabinet table saw is a dream come true for any contractor who is looking for a high-quality, durable table saw that will last a lifetime. In fact, Powermatic believes in the quality of the saw so much that they are giving you a 5-year warranty to insure your purchase. 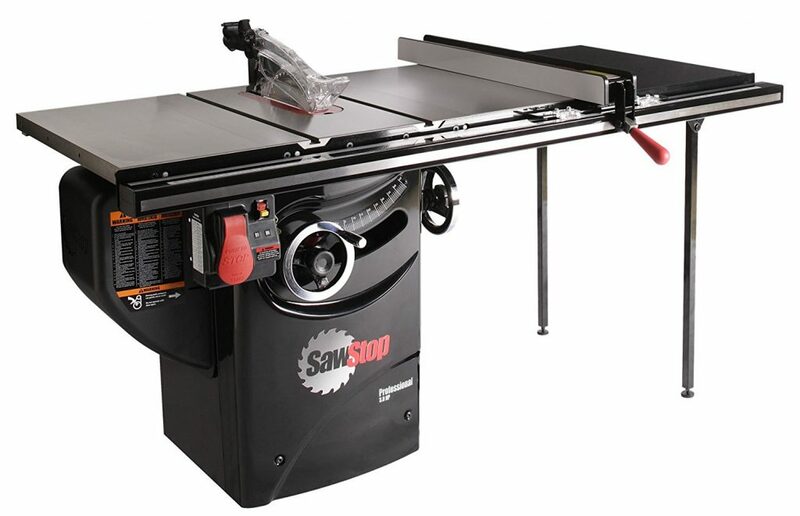 The SawStop PCS31230-TGP236 is another 3 HP cabinet table saw that is worth looking at. Not only has it received rave reviews from everyone who owns one but its powerful features make it not only strong enough to get the job done but it will keep you safe too. Let’s start out talking about the built-in safety features because they are relatively unique and offer you superior protection. The PCS31230 has an electronic detection system that is so intelligently designed it can actually tell the difference between a human body part and a piece of wood. Imagine never having to worry about whether you or one of your guys is going to become the next casualty of a table saw incident. 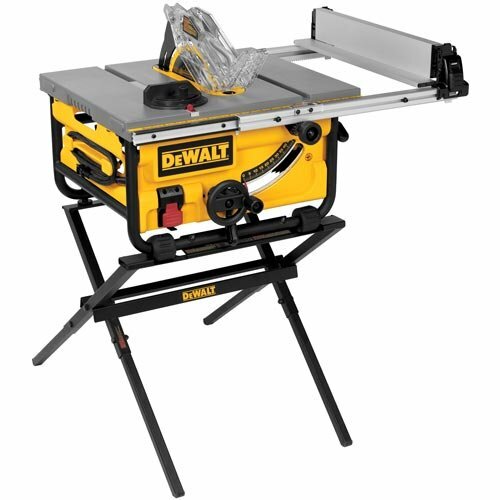 According to the Consumer Products Safety Commission there is a table saw related injury every 9 minutes and an estimated 10 amputations per day. Having an intelligent electronic detection system that saves your limbs sure has to give you a good feeling, doesn’t it? Want to know about the overall performance of the SawStop cabinet saw? Let’s talk about the 36-inch T-Glide fence system it includes that will allow you to get a precise measurement while maintaining a smooth operation for the saw. It has an industry leading cabinet saw dust collection system that will take care of all the mess so you can spend your time focusing on the job you are doing without worrying about stopping to clean up after every cut. The thing I like best about this cabinet saw is its versatility makes it perfect for woodworking hobbyist, professional woodworkers, and low-volume machine shops who want a durable table saw that gets the job done every time. The SawStop PCS31230 accepts 10-inch blades and 8-inch dado set and includes a 10-inch, 40-tooth blade to get you started. 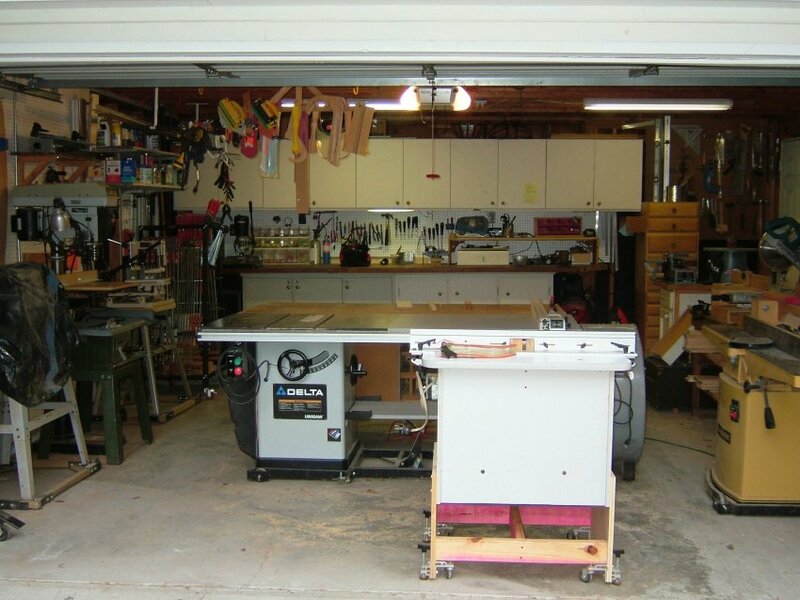 You also have plenty of options for mobility so if you need to be able to move the saw in and out of your garage, you will be able to do it with ease with the optional mobile bases that come highly recommended by everyone who owns one. 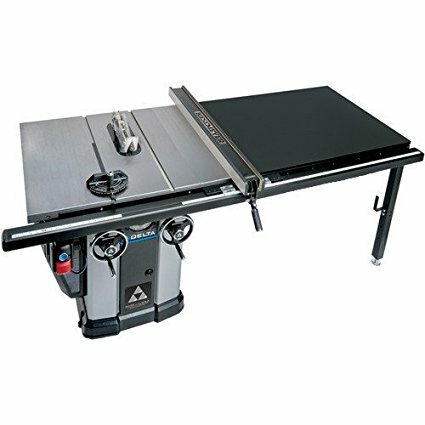 This professional level cabinet table saw does everything you need it to and is perfect for tackling any woodworking project or job you put it up against, and SawStop stands behind the PCS31230 with a 2-year warranty that protects you if something should happen that’s not your fault. 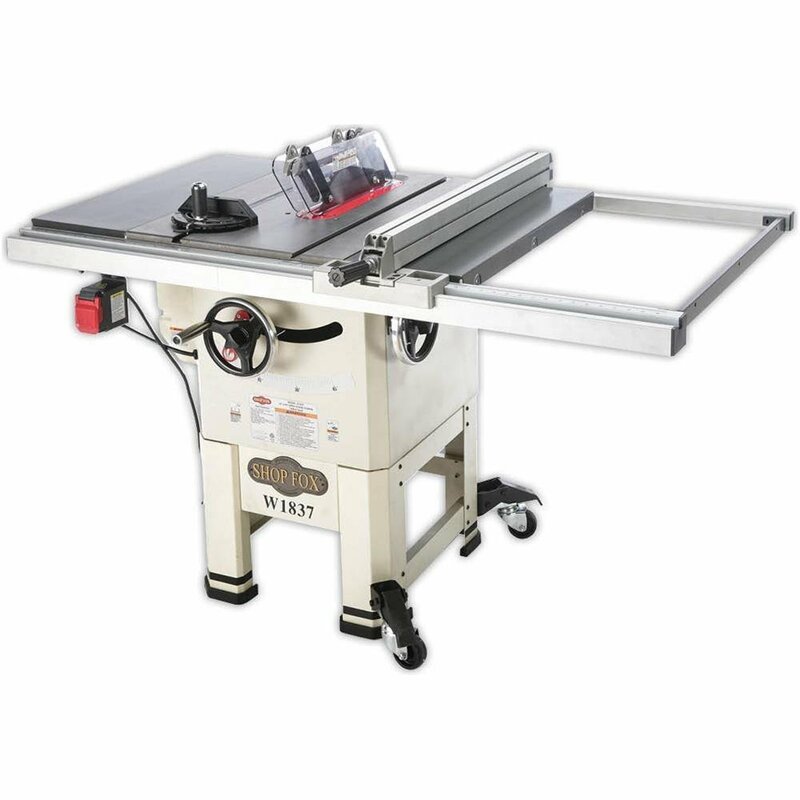 Another great option for the best cabinet table saw is the Shop Fox W1820 which is another 3 HP table saw that is the perfect balance between quality and performance. This cabinet saw features a massive cast iron table that gives you 50-inches of rip-capacity. Want to get an idea of how big that is? You will have plenty of space to easily saw through the center of a standard sheet of plywood. So large projects are never a problem for the Shop Fox W1820 table saw. You will be able to easily see every single cut you make thanks to the clear polycarbonate blade guard that provides high visibility. 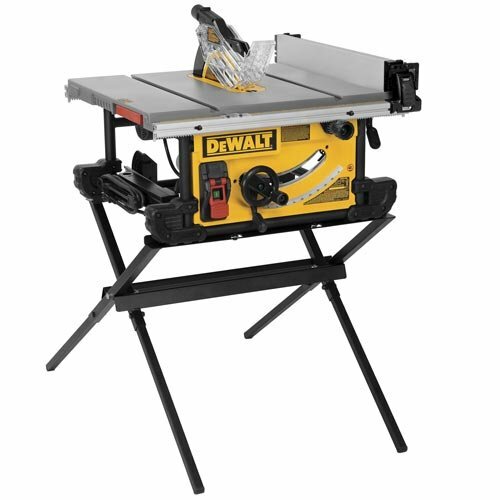 Safety is always a huge concern for anyone operating a table saw. So with that in mind, Shop Fox decided to include anti-kickback pawls that only allow the wood you are cutting to move in one direction. If the board starts to kickback, the pawls will dig into it and stop it before it has a chance to do any damage. You will also be able to tilt the blade to the left anywhere from a 0-45-degree angle and make fast and easy adjustments for any type of cut you are making. 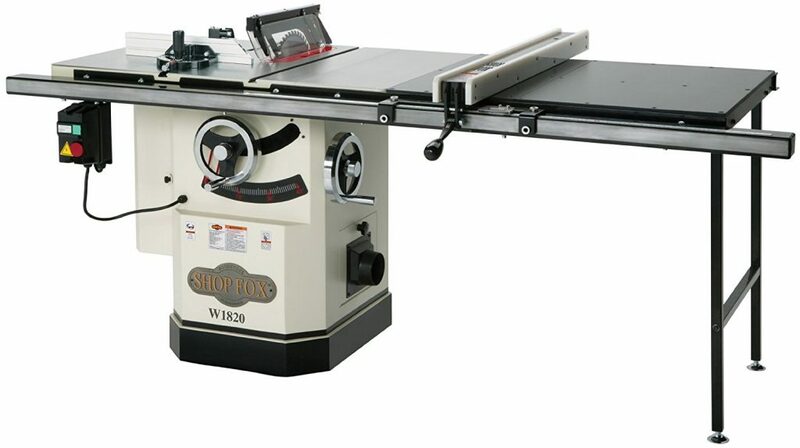 The Shop Fox W1820 also has an optional mobile base that will make it easy to roll around if you happen to be in a crowded space and cleanup will be a breeze with the 4-inch dust collection port that takes care of almost all of the saw dust that is left behind from every single cut you make. This is one rugged and durable table saw that was built to last a lifetime and could very well possibly be the last cabinet table saw you ever purchase. 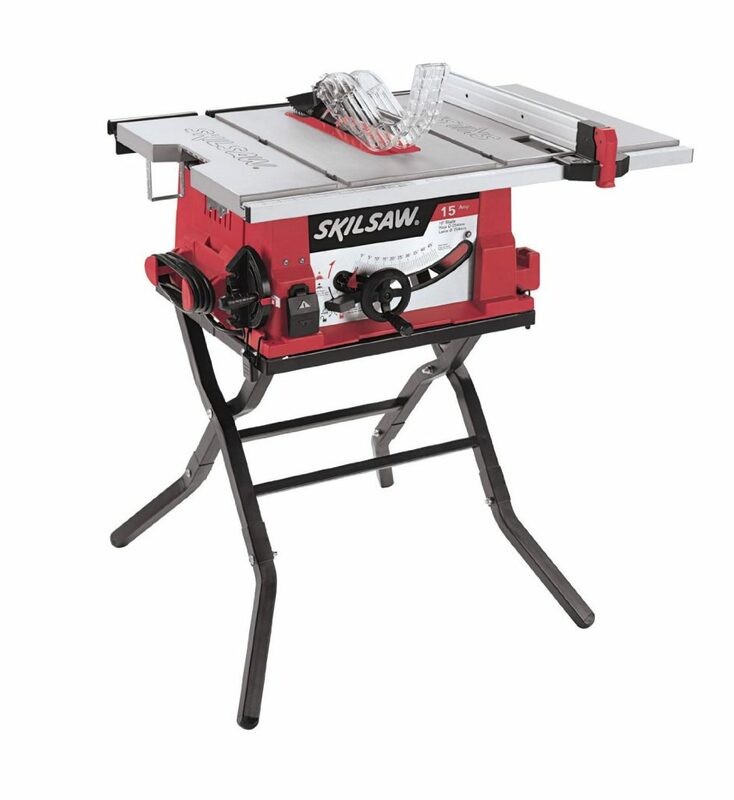 With a strong cast iron table and wings, huge cast iron trunnions, and a square steel tubing frame you won’t find yourself replacing this saw any time soon. Priced affordably for the professional woodworker, hobbyist, or even a small production shop the Shop Fox W1820 is has everything you need to do any job and you get the security of knowing that you are protected by a 2-year warranty. The Delta Unisaw is packed with several user-friendly features that any woodworker looking for a professional quality saw that can tackle a wide range of jobs. For starters the oversized dual front cranks will allow you to quickly and easily make blade adjustments so that you get those accurate cuts you need. You’ll be able to protect your knuckles when making blade changes because the Delta cabinet table saw has the largest blade opening in its class and the push button arbor lock makes blade changes a very fast process. If vibration control is important to you then the single-cast trunnion system will quickly become one of your favorite features because it gives you smooth continuous control while maintaining precision accuracy. You will also get all of the stability you need thanks to the heavy cast iron base that only adds to the sturdiness and virtually eliminates table vibration, and just in case you ever need to turn the saw off using your knee or foot, the large on/off switch that can be accessed from any angle is something that will come in handy as well. You will get a superior dust collection from the Delta Unisaw so you will be able to see better and cleanup will only require light work to get the small amount of dust that might be missed occasionally. One other feature that you are really going to love is the built-in storage drawer that allows you to store 5 saw blades, 2 riving knives, an arbor nut flange, and the entire rise and fall split guard assembly. So you will never have to worry about losing any of your valuable tools and will have easy access to them when you need them. If you are a professional woodworker then you are really going to love the Delta Unisaw and the 5-year warranty that comes with it. 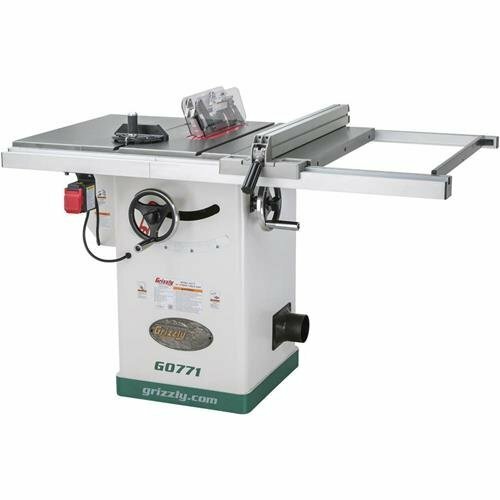 The Jet 708675PK XactaSaw was built for getting those big jobs done and it is loaded with several commercial grade features that any professional woodworker will enjoy. For starters, the large cast iron table measures 29 X 42-inches so you will be able to easily load big sheets of wood onto it. The exclusive 50-inch commercial fence II with T-Square provides you with all of the precision and safety you need when you are using a table saw. You are also getting a large cast iron trunnion that will eliminate table vibration and ensure you get a safe, smooth cut every time. The heavy duty dual cast iron hand wheels will allow you to make blade adjustments quickly and easily. With a durable design you can be sure you are buying something that was built to last. The Jet XactaSaw also features a left leaning design that will allow you to make quick, burn-free bevel cuts while keeping you safe at the same time. You will always feel safe using this cabinet saw thanks to the high-tech modular blade guard, anti-kickback pawl, and riving knife assembly that are all designed with your safety in mind while maintaining maximum effectiveness. Plus…you will always get the most accurate cuts with a fully-featured miter guard that was built to give you the most precise cuts possible. You will also be able to take advantage of the state of the art dust collection system that will allow you to keep your workspace dust-free so that you will be able to clearly see the cuts you are making without saw dust flying everywhere. Also, the onboard sealed storage drawer will help you store all of the tools and saw blades you need so you will never have to worry about losing them, getting them damaged or making room in another area of your garage to store them. You get everything needed to conquer your professional woodworking projects all backed by a 5-year warranty that protects against any defects. 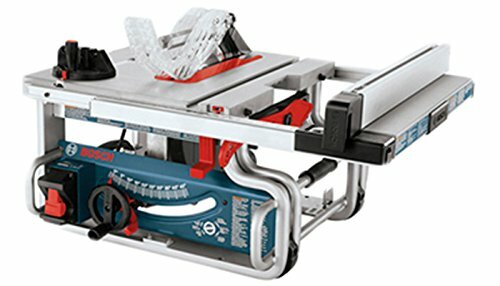 The Jet XactaSaw will make the perfect addition to your garage and will help you get your jobs done faster and safer than most other cabinet table saws you will find. 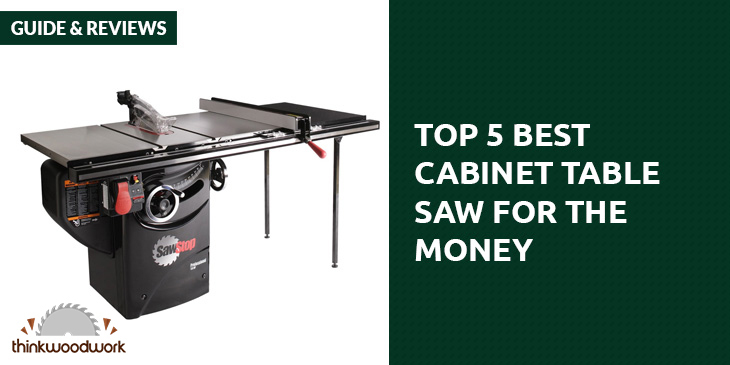 After reading through these cabinet table saw reviews, it is easy to see that these are 5 of the best cabinet saws out there. 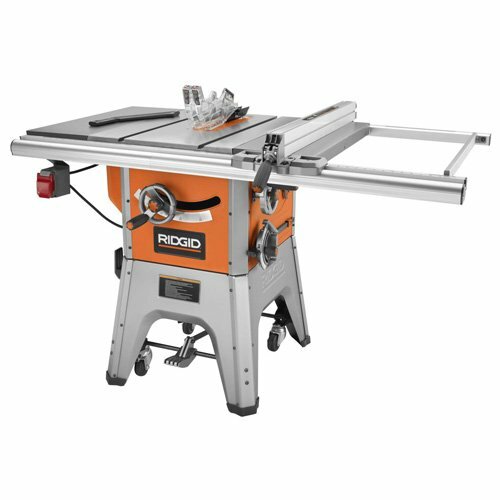 Not only are you getting plenty of power from a 3 horsepower motor that comes with all of these saws but you are getting all of the safety features needed as well as precision cutting power that gives you the accurate cuts you need. 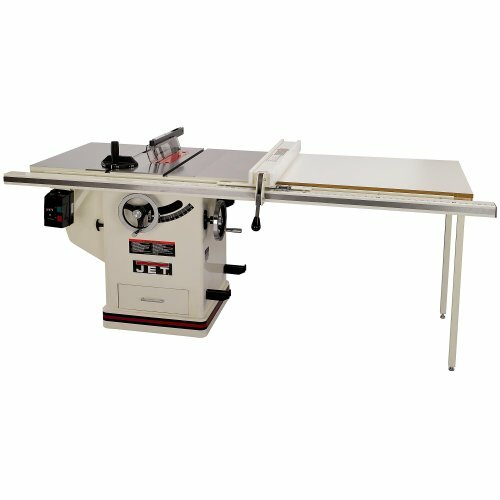 If you are looking for the best cabinet table saw out of the 5 we reviewed, then the Powermatic 1792000K PM2000 with its oversized cast iron base that is the heaviest in the industry and huge oversized tables along with all of the power-packed performance features that are included is easily the best cabinet saw you will find. 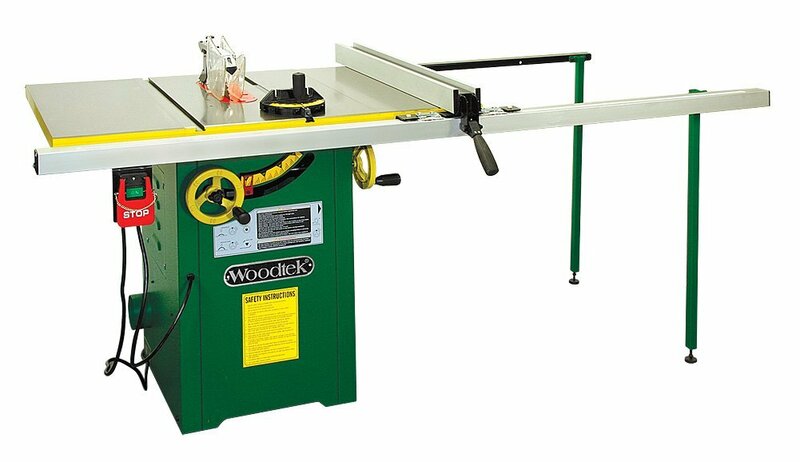 Also, out of the cabinet saw reviews that I did, I would recommend the Shop Fox W1820 because it has features that are suitable for the professional woodworker as well as the hobbyist and for the money you just can’t beat everything it provides.